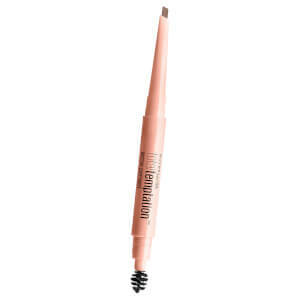 Achieve enviable arches with Maybelline's Total Temptation™ Eyebrow Definer; a dual-ended, mechanical brow pencil that allows you to shape and groom for professional results. Featuring a teardrop tip for easy application, the must-have tool fills in sparse brows with natural, hair-like colour, whilst its spoolie brush expertly controls and grooms unruly brows to create a perfectly defined look. G2014168 Synthetic Japan Wax Stearic Acid Synthetic Fluorphlogopite Hydrogenated Soybean Oil Hydrogenated Coco-Glycerides Zinc Stearate Polybutene Hydrogenated Vegetable Oil Cera Alba / Beeswax / Cire Dabeille Myristyl Myristate Copernicia Cerifera Cera / Carnauba Wax / Cire De Carnauba Polyglyceryl-2 Triisostearate Vp/Eicosene Copolymer Tocopherol Citric Acid [+/- May Contain / Peut Contenir Ci 77491, Ci 77492, Ci 77499 / Iron Oxides Ci 77891 / Titanium Dioxide] D212789/1.